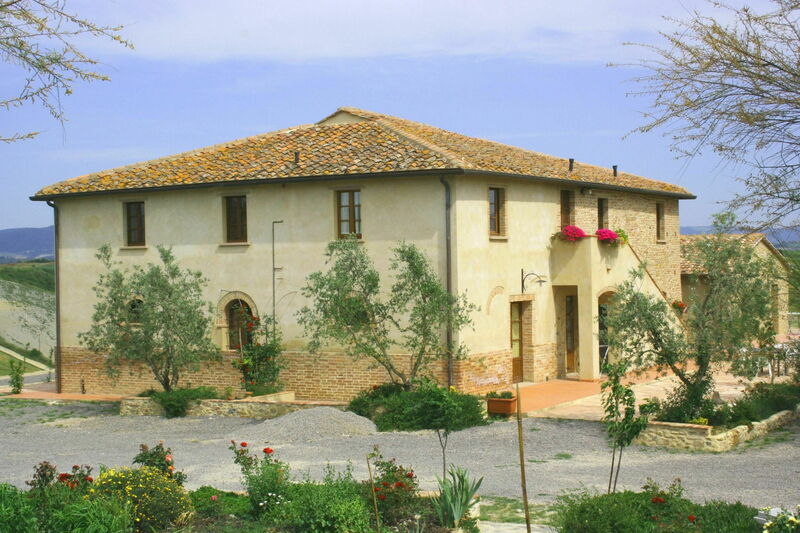 Nice farmhouse quietly situated affording beautiful extensive views over the surrounding landscape. The house has been recently restored with its original architectural features preserved and turned into 5 charming apartments, all of which tastefully furnished in a typical Tuscan style. Distances: the small town of Villamagna with food shops 4 km, Volterra with all kinds of shops 25 km, Pisa and Florence approx. 50 km. The renowned medieval town of San Gimignano is in a 30-minute drive. At guests’ disposal: large furnished garden, swimming-pool (15 x 9 m – maximum depth 1,5 m – open from 01/05 to 30/09) with Jacuzzi area set in panoramic location, shared barbecue. The access to the property is via an unpaved but well-maintained road. Parking within the property. Pets are allowed. Extra bed and baby bed available on request (free of charge). Extra services: cooking classes and painting classes upon request. Mountain bikes for rent.Walking Tracks. 55 m2. 1st floor: living-room with kitchen corner (freezer) and double sofa-bed, double bedroom, bathroom with shower. Furnished outdoor area.